Today I’d like to talk about the fact that we often know what we don’t want in life but we rarely formulate it in a way that says what we want. 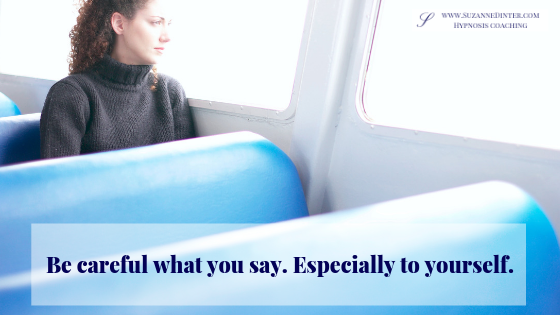 And also about the negativity – the negative talk that we say to ourselves, in our head or out loud. We need to turn it around because your subconscious mind is listening. Now that is packed in negativity. He thinks it’s positive, that’s how he would like to be: trusting himself not to fail. I pointed out to him in a very friendly way that that is a negative outcome. Your subconscious mind is listening and which word does it hone in on? Trusting myself not to FAIL. He reformulated it to: “Trusting myself to succeed and to be successful.” Much better! Another person said that she wants to stop second-guessing herself. Which word does your subconscious mind hone in on? “Okay, we’ll carry on second-guessing yourself!” She’ll get more of what she’s asking for. We reformulated it to “trusting her decisions.” She wants to trust her decisions and instincts more to get what she wants. Okay, her subconscious mind says, “Ah! Procrastination? Do you want more of that? Right you are, here you go!” And it carries on the pattern that you had previously. You need to change it around to make what you want positive. So the positive suggestion could be, “I want to take more action. I want to do the work. I want to get out there and be present every day.” Whatever suits you. Turn it around so that your goal is positive and your subconscious mind will help you to achieve that. Another one: “I’d like to not feel anxious about social events.” Which word does the subconscious mind hone in on? “I’ll give you more of that, that’s no problem!” And you continue the pattern. We turned that around. These are the exact words that she wanted to be after she realised that she’d formulated her goal negatively: “I want to feel confident, calm and happy in my own skin.” And she is very, very happy now about social situations and presenting herself. She’s doing regular videos and films and absolutely loving it. These are patterns that you need to first become aware of and then you can change them to something more positive. Mostly, people are not aware of the negative pattern and when I point it out, they realise and modify. It takes a bit of practice and you soon get the hang of it. That’s part of how hypnosis works – we turn negative statements around. And we ask ourselves, what is the outcome that I want? Not what I don’t want. Your subconscious mind will help you to achieve that. Your subconscious mind is not some kind of external thing “out there”. It’s not voodoo magic that I give you in hypnosis, it’s something that you have inside of you. You haven’t quite learnt how to activate it and use it to your advantage. Hypnosis can help you to do that, turn things around and utilise your subconscious mind. I’ve had great results with my clients in improving their confidence and their self-belief, their self-esteem and achieving their goals. If you would like some deep, subconscious help in turning around your negative patterns into positive ones, please book a free consultation call here. I’d love to know how I can help you. Alternatively, if you’re absolutely ready for change, please tell me what you want to change and how you’d love to be and book your 60-minute, laser-focused, hypnosis coaching taster session for €99 here.